The Sea-Dweller Deepsea is the most impressive diving watch from Swiss luxury watch manufacturer Rolex. It is extremely precise and can withstand extreme depths without a problem, making it interesting for both professional and recreational divers. Diving watches have long been a part of the Rolex catalog. While Rolex wasn't the first to manufacture diving watches, it's safe to say that the Swiss luxury watch manufacturer produced the mother of all modern diving watches with the Submariner in 1953. One of its descendants is the Rolex Sea-Dweller Deepsea, which was introduced in 2008. In terms of performance, it is in a league of its own. Unlike its little sister, the Rolex Sea-Dweller 4000 which is suited for dives down to 1,220 m (122 bar, 4000 ft), the Rolex Sea-Dweller Deepsea is water resistant to 3,900 m (390 bar, 12,795 ft). This puts it well ahead of competitors like the Omega Seamaster Planet Ocean, the Breitling Avenger II Seawolf, and the Tudor Pelagos. This is possible thanks to its special case construction, which Rolex calls the Ringlock System . It has a ring of nitrogen alloyed stainless steel at its center, lending the 44-mm case made of 904L stainless steel its exceptional stability. Combined with a grade-5 titanium case back and 5.5-mm thick sapphire glass without a Cyclops lens, this watch can withstand three tons of water pressure on its case. These watches are tested in a pressurized container developed by Rolex in cooperation with COMEX (Compagnie Maritime d’Expertises) to guarantee that every Deepsea can cope with these extreme conditions. 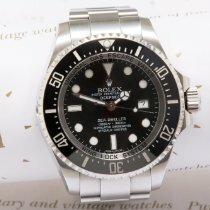 How much is a Rolex Sea-Dweller Deepsea? You can get a new Rolex Sea-Dweller Deepsea on Chrono24 starting for as little as 11,100 USD. Pre-owned models are less expensive at 8,600 USD. 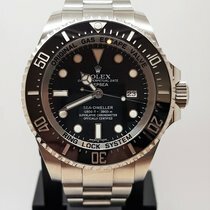 Plan to spend around 10,500 USD for a pre-owned Deepsea D-Blue in very good condition, and around 14,300 USD for a new model. The successor models introduced in spring 2018 have the reference number 126660 and are expected to retail at a list price of 11,700 USD for the standard edition and 12,000 USD for the edition with the D-Blue dial. Perhaps you are more interested in the alternative 40-mm Sea-Dweller 4000 with the reference number 116600. This much thinner model was only in production for three years. Since production ended, it has only grown in popularity among collectors, resulting in higher prices. 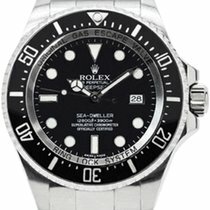 A Sea-Dweller 4000 in very good condition that cost less than 9,900 USD a year ago now costs between 11,500 and 14,900 USD. The 2017 Sea-Dweller with the reference number 126600 is also worth taking a look at. It is 43 mm in diameter and is the first Sea-Dweller to feature the typical Rolex Cyclops lens. Offline retailers sell this watch for 12,800 USD, though that also comes with long wait times. Purchasing online means you don't have to wait, but the price jumps to between 13,900 and 15,300 USD. 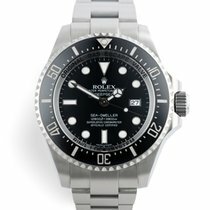 The standard Rolex Sea-Dweller Deepsea with the reference number 116660 has a black dial and a date display at 3 o'clock. The name "Deepsea" is written in white lettering directly below the company name, and the words "Oyster Perpetual Date" can be found at 12 o'clock. The water resistance "12800ft = 3900m", the model name "Sea-Dweller", and its chronometer inscription are all located above 6 o'clock. In addition, its stainless steel rehaut includes the engravings "Original Gas Escape Valve" and "Ring Lock System." The Rolex Deepsea D-Blue was introduced in 2014. The only thing that sets it apart from the standard model is its dial – even the reference numbers are the same. As indicated by its name, Rolex chose a dial with a gradient that goes from dark blue to black. The other difference is the relocation of the "Deepsea" inscription to above 6 o'clock, where it shines in a bright green. Since this watch was developed in celebration of Hollywood legend and "Titanic" director James Cameron's dive into the Mariana Trench, Rolex fans have given it the nickname "Cameron." The Deepsea has a screw-down crown, a helium escape valve, and a black unidirectional Cerachrom ceramic bezel with platinum covered 60-minute markers. 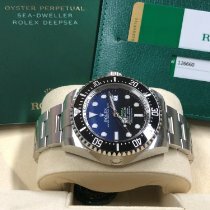 It also comes with a typical Rolex stainless steel Oyster bracelet, which is easy to adjust thanks to its Oysterlock fold-over clasp and practical Glidelock and Fliplock extension systems. Glidelock makes it possible to lengthen the bracelet up to 20 mm in 2-mm increments. Fliplock, on the other hand, allows the bracelet to be lengthed by 26 mm. At Baselworld 2018, Rolex presented the updated Deepsea ref. 126660. It has the same 44-mm diameter, but its lugs and flanks are somewhat thinner. Unlike its predecessors, which were powered by the caliber 3135, these new models feature the chronometer-certified caliber 3235. It boasts high precision, a 70-hour power reserve, and an increased tolerance to magnetic fields. The ref. 126660 is available with a black or a D-Blue dial. The history of the Rolex Deepsea begins all the way back in 1960, when marine researchers Jacques Piccard and Don Walsh dove down roughly 11,000 m (36,089 ft) into the Mariana Trench in their bathyscaphe called Trieste. Rolex had developed the experimental Deep Sea Special specifically for this occasion. The watch was attached to the outside of the submersible vessel and survived the dive completely unscathed. Many of the new findings from this experiment were later used to develop the Rolex Submariner and Sea-Dweller diving watches, which ultimately led to the Rolex Deepsea. 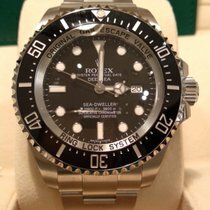 On March 26, 2012, Rolex sent yet another watch into the depths of the Mariana Trench. This time it was on the arm of the Deepsea Challenger submarine piloted by Hollywood director James Cameron. The watch known as the Deepsea Challenge was enormous: It was 51.4 mm in diameter and 28.5 mm thick. The sapphire glass alone was 14.3 mm. The Deepsea Challenge followed in the footsteps of its ancestor from 52 years before and withstood the trip to the deepest point on Earth without a problem. Unfortunately, this watch is not for sale.